I crave garlic the way some people crave chocolate, so every year when National Garlic Day rolls around, I try to make the most of it by sharing a particularly garlicky dish and inviting my friends to do the same. Since I made dessert last year, I thought I go with an entree this year. Originally I'd planned on doing a twist on one of my all-time favorite dishes, chicken with 40 garlic cloves, using beef brisket. Switch out the herbs, use red wine instead of white wine...but alas, I couldn't get my hands on a brisket. I should have known I'd need to order it from the butcher in advance; Texas this is not. I didn't plan ahead, so my plans changed. Staring at the butcher case, I decided to go with flank steak since I can't even remember the last time I ate (let alone made) it. But I didn't want to do the same dish since it's a dish that's better when cooked slowly...and I didn't want overcooked, chewy flank steak. So, I had some flank steak staring me down. I also had a big, beautiful bunch of rainbow chard in my crisper. Greens and garlic are a match made in heaven, so I decided that combining all three would give me a bang-on garlicky good meal. For one flank steak (I got a good 2 pounder), I used 10 fat cloves. It was odorific! My teenager was out that evening at a sporting event, and when he got home 5 hours after it was made, he said "ooooh, I smell garlic" the minute he walked in the door. Mission accomplished. If you don't love garlic quite as much as I do, you can definitely decrease the amount you use. This dish makes a beautiful and somewhat impressive meal to serve guests, but it's simple and quick enough to make on any given night, really. To see more amazing options for adding garlic to your table, check out some more delicious dishes being shared by some of my blogging friends after this recipe! 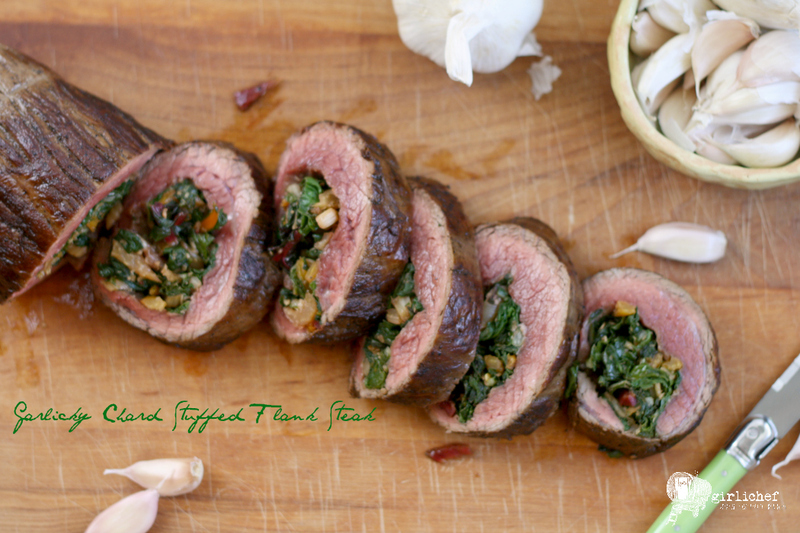 This flank steak stuffed with garlicky rainbow chard not only looks beautiful on the plate, it is also fairly simple to make. Separate the chard leaves from the stems. Slice the stems into 1/4-inch thick slices; roughly chop the leaves. Set a large, deep skillet over medium-high heat and add 2 tablespoons of the olive oil. Add the chard stems and saute until they start to get tender, 3-4 minutes. Add the garlic and saute, stirring constantly, for 30 seconds. Add the chopped chard leaves, the crushed red chiles, and a couple pinches each of salt and pepper. Saute until the leaves are wilted and tender, 3-4 minutes. Remove the pan from the heat and stir in the Balsamic vinegar. Set aside while you prepare the meat. Lay the flank steak out on a large work surface. Use a meat mallet, heavy skillet, or rolling pin to pound it out until thin enough and large enough to roll up; it will be about 1/2-inch in thickness. 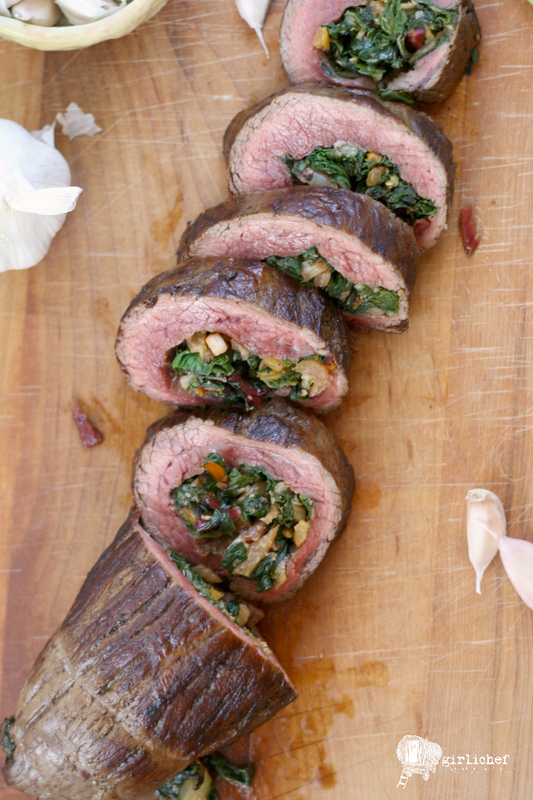 Spread the garlicky chard mixture over the flank steak, leaving a 1-inch border on all sides. Starting at one of the longer edges (going with the grain, so the long lines run lengthwise on the roll), roll the meat up jellyroll-style. Tie the roll in 2-inch intervals using kitchen string. Sprinkle with a little bit of salt and pepper,. then drizzle the remaining 2 tablespoons of olive oil over it and rub it in. Set a large cast iron skillet over medium-high heat. Once piping hot, set the rolled flank steak into the pan. Cook until deeply browned on all sides, turning as needed. Meat should be cooked to medium-rare in about 18-20 minutes. If you'd like it cooked to a higher temperature, reduce heat to medium-low and cover the pan with foil for another 10 minutes or so. Remove the meat from the skillet and set on a cutting board. Tent loosely with foil and allow to rest for 10 minutes. 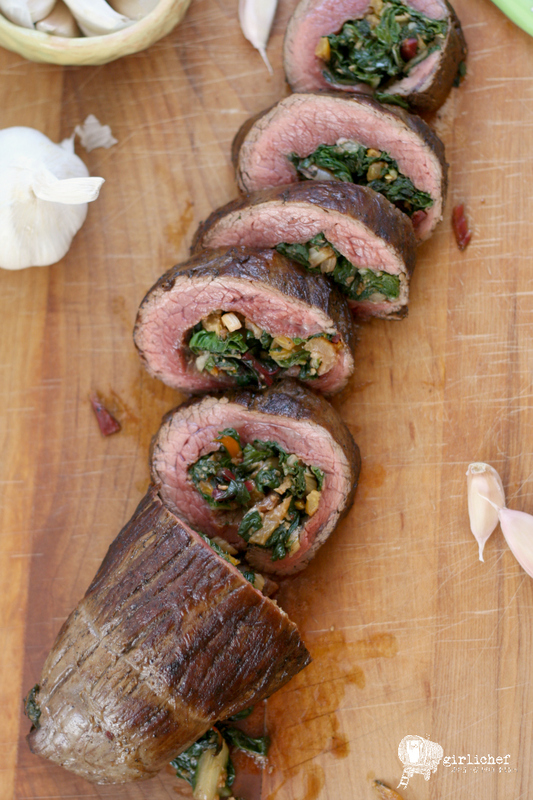 Cut the rolled flank steak into 1/2-inch thick slices and serve. If you don't have (or enjoy) rainbow chard, you can substitute your favorite green. This recipe is for garlic lovers. If you like it, but don't love it, feel free to reduce the amount you use. If you find that the meat is too rare for you, you can carefully set the slices into a pan to cook a bit longer. Calling all garlic lovers! 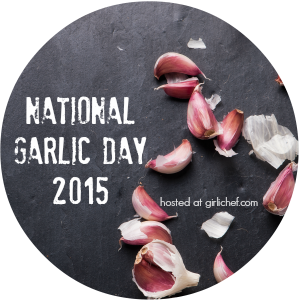 Welcome to National Garlic Day 2015, hosted by Heather from All Roads Lead to the Kitchen. April 19th is a day for garlic lovers far and wide to come together and celebrate the wonder of "the stinking rose". Whether it's the ability to ward off vampires (and bugs), its numerous health benefits, or the way it lends flavor to a dish, there are so many reasons for singing the praises of garlic. The Best Garlic Bread in the History of Ever. Really.